This section presents how to install SGML License Manager. SGML License Manager is required for REQCHECKER™ PRO Floating and REQCHECKER™ PRO CL Floating. The license manager is as well an HTTP server that presents the connected users. SGML License Manager is a Windows executable program that must be deployed on a physical server only. Windows administrator rights are required. SGML License Manager can be deployed in an intranet. An Internet connection is required if SGML License Manager is deployed on an internet server. Copy the hardware key (3EDA52A0 in this example) and send it to KHILOGIC with the contact form https://reqchecker.eu/contact/. 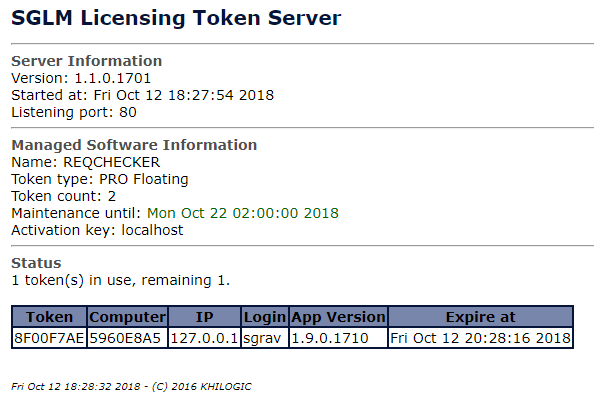 The message shall include if the requested license key shall distribute REQCHECKER™ PRO Floating or REQCHECKER™ PRO CL Floating. You will receive the activation key by email in a few day. Please ensure that your company is able to receive email from support@reqchecker.eu. Enter an unused HTTP port. Leave 80 if you do not known what it is. Open the status page indicated in the Real time status page: field. Check the number of ordered tokens. This task is higly recommended to ensure SGML License Manager will be available after a system reboot.